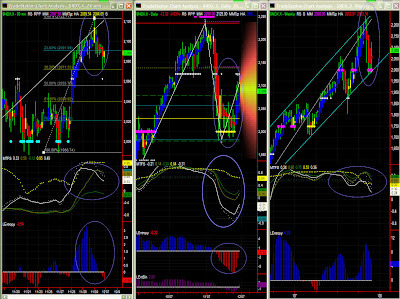 Market direction: Good recovery potential but lack of energy in the short term. Spot on: congestion was indeed expected after almost the 2125 MM target. 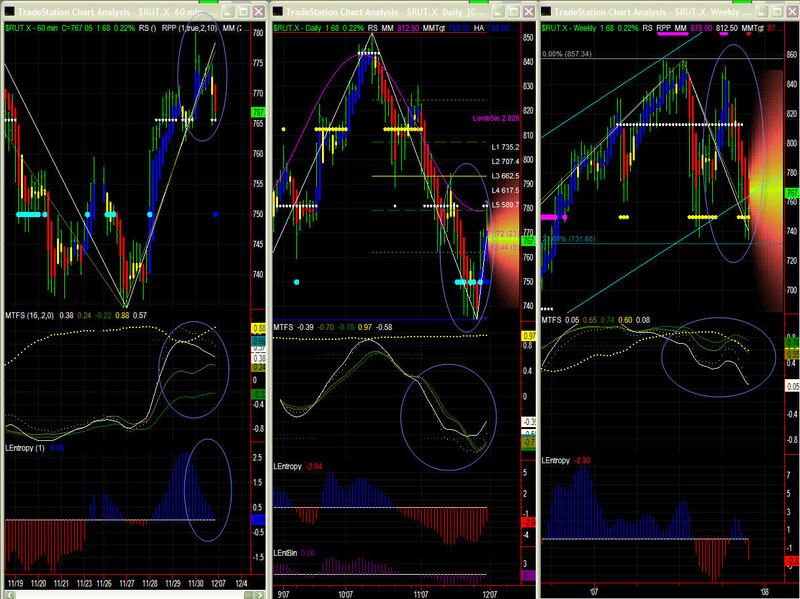 Again the high level of volatility then allowed a significant retracement. After reaching for 2125, NDX fell right down to Fib PR1. There is however no positive energy to have any strong bounce on this Fib level, so NDX should remain in the same [2070-2100] trading range with a mild lower bias. The daily chart shows the clearest pattern of all 3, but unfortunately isn't the most significant time frame, so may find it difficult to reach its target in the short term. Again this pattern only has a limited upward potential because of the low green line. It is only if/once 2125 is passed that NDX will likely return to the overall bullish trend and reach Fib targets (2140 first), with 2250 being very significant (strong MM resistance as well). NDX is firmly back in its channel. 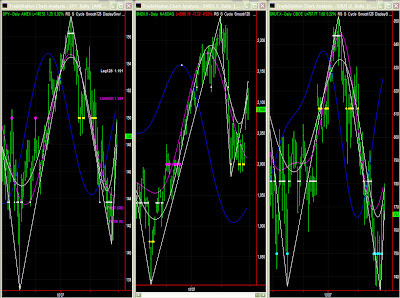 However current movements are too fast for this time frame at the moment, explaining the low significance level (53%). With all the necessary caveats already described extensively on the ts-trading-technique site, here are the calculated cycles at this point in time. Interesting to see that like the other 2 symbols under study, RUT had to reach PR1 and stall level around 780. 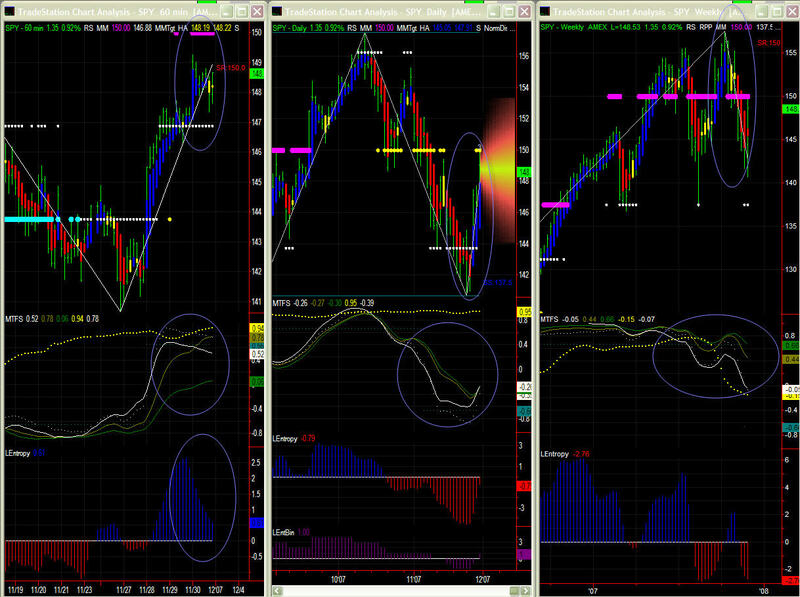 Same as previous post: MTFS Pattern is unclear but parallel and slightly downward MTFS lines tend to indicate congestion, and Entropy has also peaked. Upward bias might vanish soon. In such case, check Fib support levels. This early MTFS crossover is very seldom conducive to a definite change in direction. 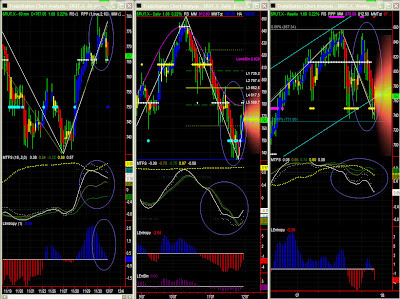 A congestion is likely, and RUT should try and find a stronger base for support. In some cases, it indicates a failed recovery, but one can assume 750 would offer a strong resistance to bears. We're now back in our [750-875] range, and still pretty much directionless. It will be interesting to see whether RUT closes the week over the lower end of the channel (~763). It seems that the 'double top' scenario is now a little more remote, but we should wait for the bar to at least change colour first. Until then the bias remains down. The recovery that was earlier stopped on PR1 (from previous down leg), this time extended to stall level i.e. 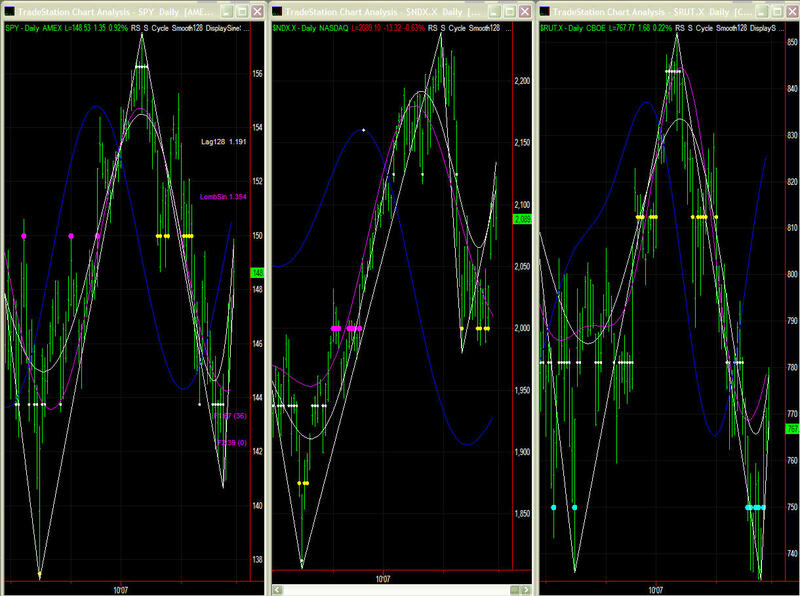 short of strong MM resistance, half way between intermediate resistance (white dots) and upper resistance level. Such 150 level remains a target, but energy is now exhausting, and MTFS is also weakening. So, despite the upper bias, there is virtually no chance SPY passes 150 in the short term. 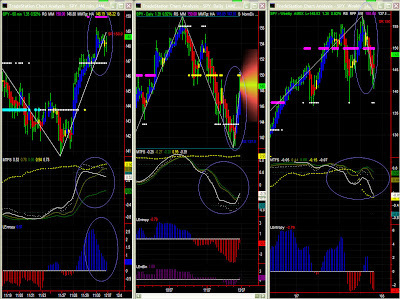 As mentioned on previous post, we'll have to wait for a pattern to develop, possibly a cup & handle formation. There is however no downward pressure right now, so difficult to estimate where a stronger support level will be found. This time frame has such a low significance level it is almost pointless reading it. 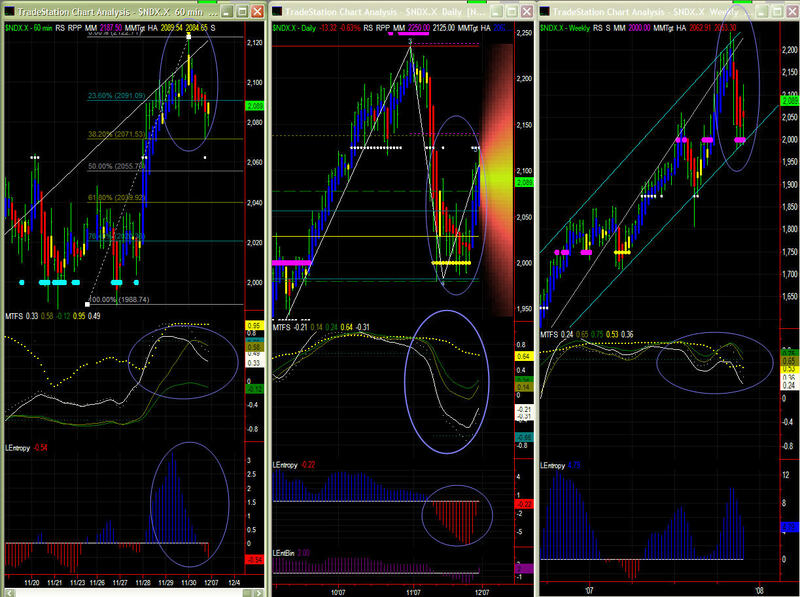 We can only rely on the Swing indicator as well as MM and Fib levels. For the time being, it is safe to say that we are in a broad trading range slightly downward biased. Failure to pass the 150 strong resistance level would become alarming if significance level wasn't so low.